Is your chimney showing distinct signs of aging such as cracks and corrosion? Has water seeped into the cracks and frozen, causing them to expand even further? 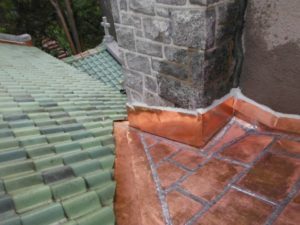 Would you like to update the look of your chimney by having a custom copper cap installed, in addition to any necessary repairs? If you answered “yes” to any of these questions, Roland Slate Service is the chimney repair company to turn to. We are experts in all aspects of roofing, including chimney repair, and can give you the service you need at a price you can afford. We will assess the state of your chimney and recommend the best possible repair solutions while keeping the project within budget. This allows us to work closely with our customers and provide a level of service that is virtually unmatched by our competitors. We never use subcontractors for masonry work, and can therefore keep a tight grip on quality control. We stand by the work performed by our technicians so you can have complete peace of mind in your investment. To learn more about why Roland Slate Service is the chimney repair company of choice in the Ellicott City area, contact us today and schedule your free consultation.